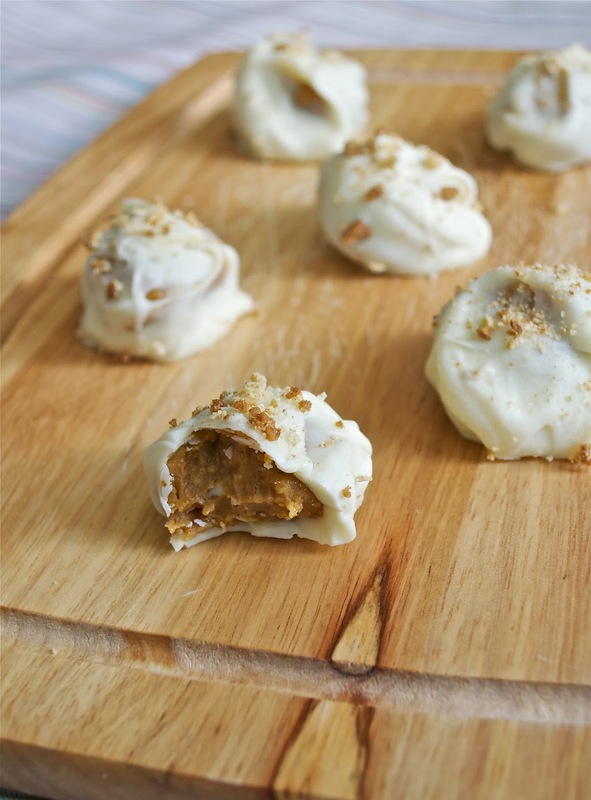 These Pumpkin Gingersnap truffles are delicious and super easy to make. The only thing that I found to be a little tedious about them is was crushing all the gingersnap cookies. They are pretty hard as far as cookies go and it definitely gave me an arm workout using my rolling pin to crush them all. Anyways, this is a perfect dessert to bring with you to any fall gathering and they are sure to go fast. 1. In a large bowl, combine gingersnap crumbs, graham crack crumbs, pumpkin puree, sugar, cinnamon, salt and cream cheese and beat until smooth. 2. Melt the 1/2 cup of white chocolate chips in the microwave by stirring every thirty seconds until it is smooth. Add the melted white chocolate chips to the mixture and stir well to combine. 3. Cover the mixture and chill in the fridge for about 2 hours until it is solid enough to form into balls. 4. Line a baking sheet with parchment paper and roll the mixture into balls (about 1 tbsp each) and place on the baking sheet. (I coat my hands with nonstick cooking spray or coconut oil spray to do this to make things easier.) Once you have used all the mixture, place the baking sheet into the freezer for a few minutes. While the balls of the pumpkin mixture are in the freezer, melt the 2 cups of white chocolate chips, being sure to stir every 3o seconds. 5. Dip each ball into the melted white chocolate chips using a spoon and make sure the entire thing is covered. Then place back on the lined baking sheet and garnish with some extra graham cracker or gingersnap crumbs if desired. 6. Chill truffles until the chocolate has hardened. Store in an airtight container in the fridge.